Leaving Prickly Bay, Grenada, on July 1st, late in the afternoon, it felt like an exodus. It is the start of hurricane season and lots of boats have been waiting for a good window to go West to Venezuela or South to Trinidad. When the window came, everybody left. 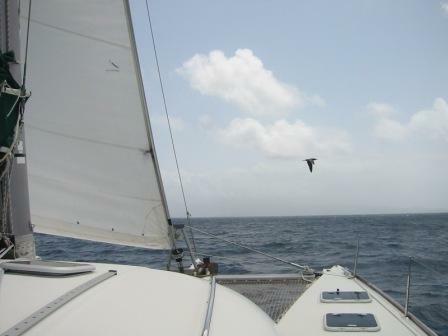 We did an easy motor sailing trip with calm seas and wind on the back. We were going in a convoy with about 6 other boats. Closest to us was Drum, with Roy and Meggie, we made contact with them on VHF. In this part of the world it feels safe to sail in a convoy, even though Los Testigos is considered a safe area so far. It was a quick overnight trip and we arrived early morning to beautiful Los Testigos, finding a very calm anchorage with amazing clear waters. To check in with the coast guard outpost, Oscar offered Spanish translation services to all other boats arriving that day and we met Drum, Living the Dream, Mustang Sally and others. We met again with Tussen Takk II, a beautiful trawler with Barbara and Chuck, we had previously met in Dominica. Gizzy, the brazilian boat we met in Grenada is also here. Having completed entry procedures we all enjoyed this beautiful place. We went into an expedition to the lighthouse on top of the hill. I had to give up half way due to heat exhaustion. 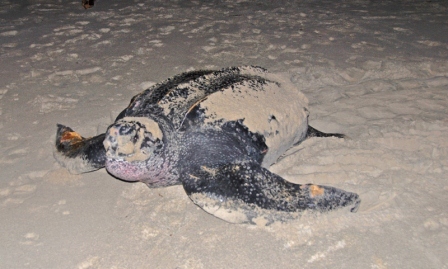 At sunset time we went up the dunes to the other side of the island where we witnessed a large leather back turtle laid her eggs. An amazing experience. Los Testigos is a peaceful place, inhabited mostly by fishermen. The only way to visit is coming by sailboat, there are no planes or ferries arriving to this remote place. We spent four days in these wonderful islands and shared good times with our new cruising friends. As we start to get to know them, we learn most of us are going the same way, planning to spend hurricane season in Puerto La Cruz. Everybody is looking forward to sail together in convoy, due to the recent piracy stories surrounding Trinidad and the Venezuelan coast. 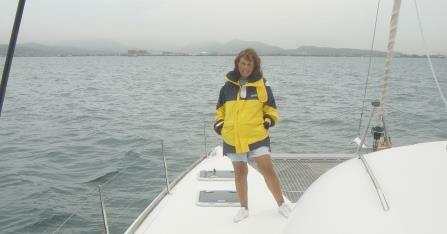 At 6:30 AM we left Los Testigos towards Isla Margarita, motor sailing in very calm seas. There was a fishing competition among all boats that left with us, Mustang Sally, Leavin' the Dream, Drum and Tusen Takk II. Oscar caught a beautiful dorado and almost won the competition. 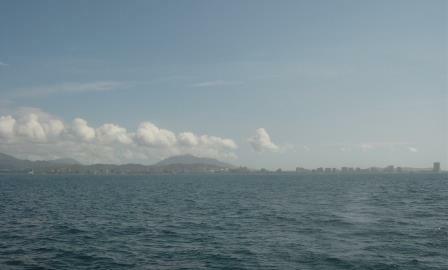 We arrived to Isla Margarita early in the afternoon to a crowded and very rolly anchorage. We hated everything about Isla Margarita. The famous low prices for shopping were non existent, all prices were excessive. The famous Juan Barros, the one that supposedly takes care of cruisers keeps trying to get money out of unnecessary check in/out procedures. On top of everything we were warned to be very careful as there had been several incidents where boats have been relieved (robbed) of anything left on deck. Even a life raft has been stolen last week. The last night at anchor we were getting ready to sleep when we heard in the VHF radio a boat calling for help. They had been boarded (with people on board) apparently by one guy. It seems that a guy came on board of Andromeda, surrender a young crew and robbed a good amount of cash money. 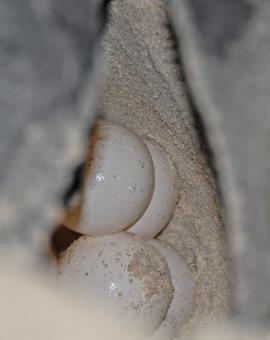 We were all shaken by this story and went to sleep armed with spear fishing gun and a flare gun next to our bed. Definitely, a nightmare. This is the first time in our cruising life we don't feel safe on board. What a relief to leave Isla Margarita. On the trip towards PLC we needed to make an overnight stop somewhere along the way to ensure we would get to Marina Baia Redonda with good light. It is too dangerous staying overnight close to Venezuelan mainland coast so we chose to stop at Cubagua, close to Isla Margarita. It is a very nice anchorage and there is a Guarda Costa post ensuring this to be a safe place. Fishermen here are nice. They gave Sergio, from Gizzy, 2 octopus and Sergio gave us one of them, which we ate with rice and later with pasta. You are only allowed to stay one night in this anchorage. We are traveling together with Gyzzy, Livin' the Dream, Tussen Takk II, Drum, and here we meet again with Daremy. At first light we leave towards PLC in squally weather. This is the last leg and we are anxious to arrive to the safety of Marina Baia Redonda. Not far from PLC we get a nasty squall with 40 knots of wind, visibility was almost nil. In the middle of this squall we heard the fishermen we just passed, joking among them, asking on the radio if they had brought their umbrellas. I was so concerned with the 40 knots wind I could not help wondering, how these guys in their little piroques had the spirit to joke and make fun of the situation. There was a lesson to be learned. Soon the squall was over and we were entering the safety of Marina Baia Redonda.